Our Hadleigh gates are built with heavy duty diagonal bracing, giving them a traditional feel. 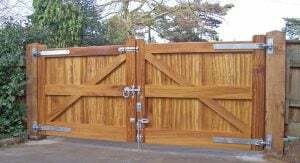 Built from both soft and hardwoods, these bespoke Hadleigh gates can come equipped with our automatic opening system, for extra security. Our Hadleigh gates can be built bespoke to your specification, and will fit your entrance exactly. All our wooden bespoke entrance gates take between 3-5 weeks to be built and delivered. To order please fill in the contact form and one of our sales staff will be in contact with you to discuss your requirements.